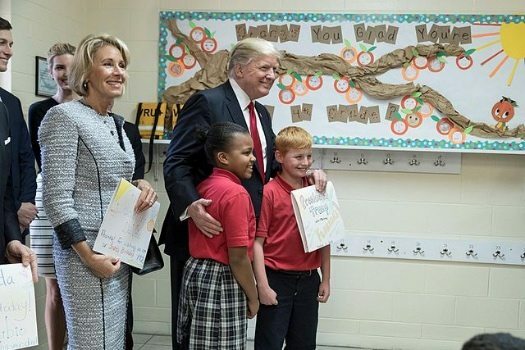 Above all else, the Trump administration’s educational platform believes the key to a great public school system is “choice.” In a recent speech to the National Alliance for Public Charter Schools, Education Secretary Betsy DeVos said, “A system that denies parents the freedom to choose the education that best suits their children’s individual and unique needs denies them a basic human right. It is un-American, and it is fundamentally unjust.” From their perspective, the choice menu must be large, and the arbiter for effectiveness should be parents and not government. Their strong advocacy has changed the reform debate. During the Obama years, disagreements arose about the effectiveness and impact of publicly funded but privately managed charter schools. Were they more or less effective than traditional public schools? Were they siphoning off resources needed by traditional public schools while being selective in whom they were accepting as students? The election of Donald Trump has opened a more complex debate about the future of public education. Jeff Henig, a Columbia University professor, sees this rift in terms of a larger political context. What may account for why this is becoming more publicly talked about is this re-opening what was always a strange-bedfellow coalition. That cleavage is widening now, with the for-profits seeing a chance under Trump and DeVos to jump back ahead in the game and the nonprofit, progressive group worrying that they’ll be tarred by the bad-apple stories…. Those folks for many years traveled together because their main battle was against the unions and traditional public schools, and the stickiness of the status quo. While charter school advocates continue this internal debate, they are also increasingly concerned about the administration’s support of voucher programs that allow parents to channel public funds (or receive tax credits) while their children attend private schools. Critics see the lack of public visibility and accountability when public monies go to private organizations as a major flaw in voucher programs. They also cite church-state issues if vouchers can be used at religious schools, and they see the shifting of limited public education funds to non-public schools as further weakening the economic foundation of public schools.